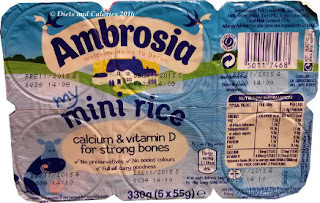 I love custard and rice pudding and those made by Ambrosia are especially delicious. However, I rarely buy these foods any more. Too much sugar, too high in calories etc etc. 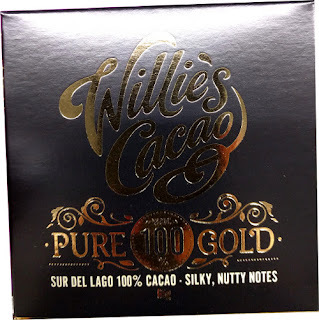 But, they do say a little bit of what you fancy is good for you, and there is a way of indulging in these snacks without worrying about the calories. Ambrosia’s mini pots of rice and custard are just 55g in size and contain a mere 55 calories. Ambrosia already sell individual pots of rice and custard and a Light Rice option see post. 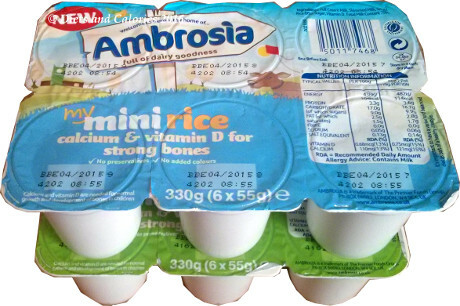 The 120g pots of creamed rice have 121 calories, while the 125g pots have 126 calories. To be honest, I think these mini sized pots are aimed at the younger members of society – namely toddlers and small children! But there’s no reason why grown ups can’t treat themselves to one of these pots now and again. These mini pots are perfect for the 5:2 diet or whenever you just need a little bit of creamy sweetness. 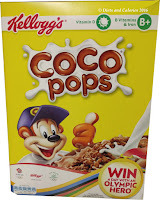 Eat them with a teaspoon to make it last a bit longer because there are only about 4 heaped teaspoons worth in each pot. 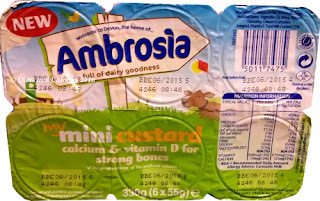 Both the rice and custard pots are fortified with Vitamin D and contain calcium. There are no preservatives and no added colours. Mini pots are sold in packs of 6 x 55g and are sold in larger supermarkets. Nutrition Information per 55g pot (Rice): 55 calories, 1.8g protein, 1.4g fat, less than 0.9g saturates, 9g carbohydrate, 5g sugars, 0g fibre, less than 0.07g salt. 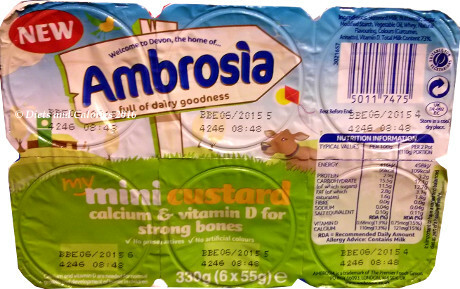 Nutrition Information per 55g pot (Custard): 55 calories, 1.6g protein, 1.6g fat, less than 0.9g saturates, 8.6g carbohydrate, 6.4g sugars, 0g fibre, less than 0.06g salt. 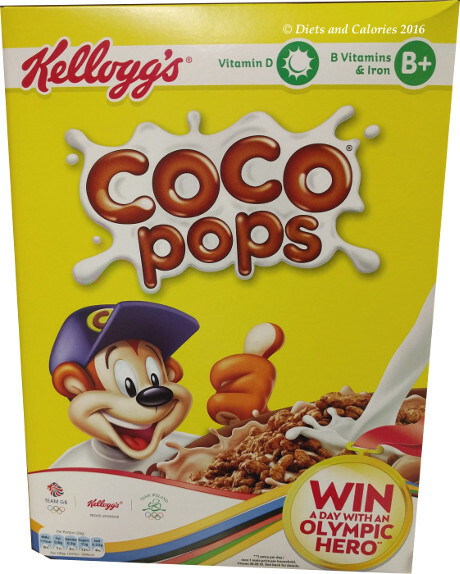 Ingredients (Custard): Skimmed milk, buttermilk, sugar, modified starch, vegetable oil, whey, natural flavouring, colours (curcumin, annatto), Vitamin D.
Ingredients (Rice): Full cream milk, skimmed milk, whey (milk), rice (9%), sugar, Vitamin D.